These are written by a Chartered and registered Building Engineer with over 30 years site experience including site and project management and are suitable for small builders to main contractors. 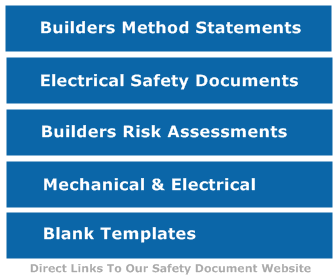 Containing Method statements, Risk assessments and COSHH, these professional documents are in MS Word and when the pack is purchased they are stored in your account downloads area, 3 downloads for each document are available giving customers back up copies. From March 3rd 2019 all documents have been migrated to our new templates. Method Statement -Installation of Central Heating Systems. Method Statement- Installation of Electrical Services. Method statement- Small building works. Method Statement- Wall and Floor Tiling. Method Statement-Block and Beam Flooring. Risk Assessment- Brick and Block work. Risk Assessment- Buried and Overhead Services. Risk Assessment- Cutting and Grinding -Abrasive Wheels. Risk Assessment-Mechanical Excavators and Excavations. Risk Assessment-Work in Confined Spaces. COSHH – Blank Assessment Template. COSHH Dulux trade diamond matt. COSHH Dulux trade weathershield smooth masonry paint. COSHH Leyland paints- High Gloss. COSHH Sikadur 32 Part A.
COSHH Sikadur 32 Part B.
COSHH Water based emulsion paint. « What is a near miss?